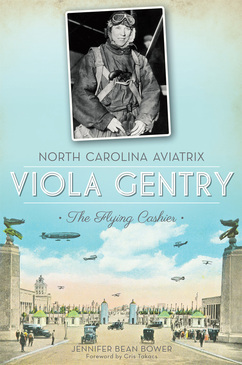 ​Viola Gentry of Rockingham County, North Carolina, learned to fly in 1924 and quickly achieved greater heights. In 1925, the aviatrix took her first solo flight. The following year, she flew under the Brooklyn and Manhattan Bridges, and in 1928, she established the first officially recorded women's solo endurance flight record. She became the first federally licensed female pilot from North Carolina that same year. She was a national celebrity, and her job in a New York restaurant secured her the nickname "Flying Cashier." Gentry became personal friends with fellow pioneers of aviation Amelia Earhart, Wiley Post and General James "Jimmy" Doolittle. After a near-fatal crash, Gentry focused her efforts on championing aviation for women and preserving its early history. Author Jennifer Bean Bower reveals the life of one of the great women in Tar Heel State history. ​Winner of the Willie Parker Peace History Book Award. Jennifer Bower has written a wonderful, in depth biography of a most incredible woman...thanks to Bower's painstaking efforts to chronicle Gentry's life in an interesting and appealing way...We learned of [Gentry's] struggles and...victories. [Gentry] was an important woman in North Carolina history and we are thrilled we got to meet her for the first time in this book. Judges' Collective Comments, Willie Parker Peace History Book Award, presented by the North Carolina Society of Historians October 2015. Animal Adventures in North Carolina directs readers to 70 opportunities-aviaries, aquariums, farms, sanctuaries, rehabilitation centers, zoos, and seasonal events-to meet new species, observe how injured and orphaned animals are cared for, discover where food ﻿products come from, and learn how to champion the cause of animals. At the Cape Fear Serpentarium, they'll see bushmasters, mambas, cobras, and numerous other snakes, lizards, and crocodiles collected by legendary herpetologist Dean Ripa. At the Horse Protection Society of North Carolina, they'll make the acquaintance of rescued horses and have the opportunity to volunteer in their care. At Conservators' Center, they'll meet servals, binturongs, jungle cats, New Guinea singing dogs, and the largest collection of lions in the state. At Sylvan Heights Waterfowl Park, they'll hear birds that honk, whistle, chirp, and coo - even some that sound like pigs grunting and people laughing. Families will find in these pages enough adventures to last them for years. Even lifelong animal lovers will be amazed at the variety of attractions North Carolina has to offer. So, what are you waiting for? Get the book, pick out a site, grab your camera and let the animal adventures begin! This guide goes beyond...generic information... you will find several pages telling...what you will find there, the best times to come, the age groups that are best... and tips to make your trip better. With this book, you will be well-educated about where you are going...before you get there... Reviewed by Joy H for Readers' Favorite. Animal Adventures in North Carolina is a very detailed and inspiring wildlife/nature guide. Included are numerous places...where one can find beautiful and amazing wildlife, opportunities to volunteer and tons of fun places to visit with children...this book has it all! Reviewed by Rita V for Readers' Favorite. Through the use of primary documents, these and other fascinating stories of Winston and Salem's past are vividly brought to life. Jennifer Bean Bower has spent many years collecting accounts of the extraordinary events that have occurred in her hometown of Winston-Salem. Winston & Salem: Tales of Murder, Mystery and Mayhem covers 118 years of history and introduces readers to real-life characters and stories not soon to be forgotten. ​​Winner of the Willie Parker Peace History Book Award. ...a fascinating book. For those who like to read non-fiction books of a historical nature that include murder and mysteries along with a touch of mayhem...this is the right choice. Reviewed by Lynn F for Readers' Favorite. This book is absolutely phenomenal...Once picked up, this book is very difficult to put down...be entertained with the turn of each page...exceptionally well-written... Judges' Collective Comments, Willie Parker Peace History Book Award, presented by the North Carolina Society of Historians October 2008. Members of the Moravian Church who settled in North Carolina were meticulous record keepers, documenting almost every aspect of their day-to-day lives. A significant part of those records is preserved in the form of photographs. Moravian photographers-both professional and amateur-created an enduring legacy by capturing their society and surroundings in faithful detail. Their photographs, which record the towns of Bethabara, Bethania, Salem, Friedberg, Hope, and Friedland, as well as other communities throughout the state, provide a rare glimpse into the historic world of Moravian life in North Carolina. Moravians in North Carolina is a Moravian photograph album that celebrates these people as they worked, played, and worshipped. Featuring archival photographs from the 1850s through the 1920s, this volume is a commemoration of the Moravian people and their lasting and constant presence within the state. ​​Since Old Salem in Winston-Salem is one of my favorite North Carolina spots, I enjoyed the photographs and commentary in this book. Reading this book made me want to visit Old Salem again. Reviewed by Lesley on Goodreads.